UCI certainly justified their selection over Hawaii to the tournament with their play against Ohio State, one of the most prodigious volleyball programs in the NCAA. 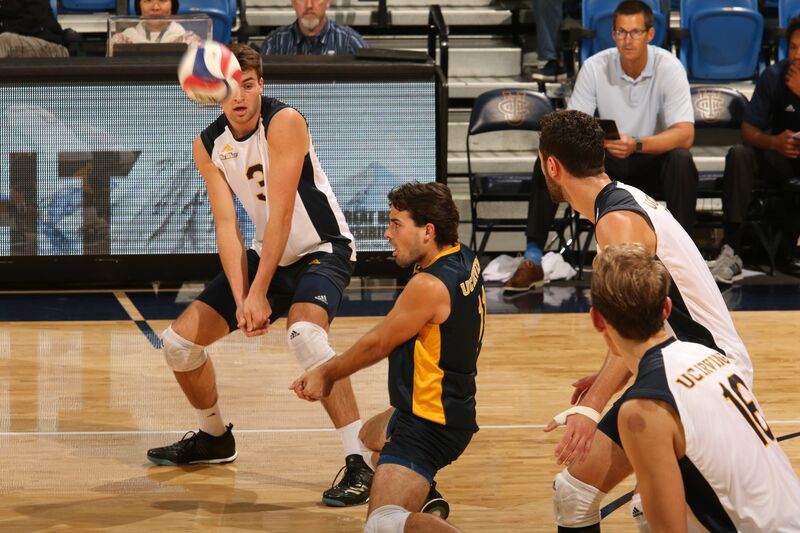 UCI’s performance, their seventh postseason appearance, was led by middle blockers Scott Stadick and Matthew Younggren. Stadick posted 12 kills, and a match-high seven blocks, while Younggren a career high 11 kills and .668 attack percentage at the net. Junior opposite Karl Apfelbach continued his team-leading offensive performance by striking 15 kills, and four blocks. Meanwhile, libero David Parker and setter Dante Chakravorti manned the defensive save unit. Parker rescued a match-high 12 digs, while Chakravorti saved seven digs and aided in 45 attack assists. Ohio’s Nicolas Szerszen played with the tallend expected by his two-time defending MIVA player of the year status, by posting 22 kills against the Anteaters. Ohio’s redshirt sophomore Jake Hanes was the dark horse offensive key for the Buckeyes, surprising the ‘Eaters with a match high 22 kills, equal to Szerszen. Hanes was the dark horse offensively for the Buckeyes, and also posted 22 kills. In the first set, the Buckeyes kept Anteater offense to a minimum by out-hitting UCI .364 to .174., and won the set handily. In set two, however, UCI played hot out of the gate. The Anteaters and Buckeyes traded points, till a 3-1 run capped by a Karl Apfelbach block gave the Anteaters a 13-12 lead. The Buckeyes retook the lead briefly, until an Aaron Koubi kill followed by Buckeye errors gave UCI a 21-18 lead and made a set two victory possible for the Anteaters. UCI had an early lead in set three, but were overcome by Ohio State’s offense, which posted a .351 attack percentage in the third. With Ohio State leading 19-23, a Joel Schneidmiller kill, an Ohio error and a UCI block brought the ‘Eaters to within one. Ohio would take the third after a contested third set. In the fourth set, with UCI leading 22-20, and momentum behind Ohio State on a three point offensive run, UCI’s middle blockers Stadick and Younggren arrested the Buckeyes offense and gave UCI a win with two kills. UCI held a brief 9-7 lead in set five, but Ohio closed and the teams exchanged terse one point advantages until tying 14 all at set point. Unfortunately for UCI, with the score 14-15 in favor of Ohio, Szerszen secured a Buckeye victory with a coffin-pinned corner kill. The Anteaters finish the year 21-10 overall, and managed to never be swept despite having arguably the toughest schedule in the NCAA this season. UCI will be returning many key starters, including Apfelbach, Stadick, Chakravorti, Koubi, Schneidmiller, Parker and Younggren. Next season, the Anteaters stand poised to make an eighth run to the NCAA tournament, in search of a fifth NCAA national championship. Following their victory against UCI, Ohio State was defeated in four sets by the No. 1 CSULB 49ers. The 49ers would advance to their second straight national title game. In the second bracket, UCLA defeated the No. 2 BYU Cougars in four sets, and advanced to the finals against Long Beach. In the championship, UCLA’s offense took Long Beach to five sets, but the No. 1 49ers managed to come out on top (15-12) in the fifth set off a Nick Amano kill to bring home another national championship for CSULB.